Do the Panthers Have a Real Backup Plan at QB? 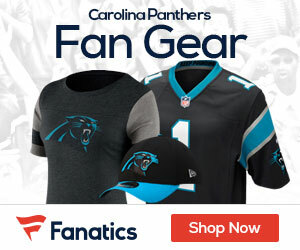 It was just like last January all over again for the Panthers fans at Bank of America Stadium. This time not quite as much was on the line for the Panthers in their lastest setback, a stunning 38-10 loss to the Philadelphia Eagles, but that doesn’t mean it was any easier to accept. The storyline of the opening day loss was eerily similar to last January’s loss to the Cardinals. And that of course seems to start and end with a bad day for QB Jake Delhomme. Just like January, Delhomme had another awful day trying to figure out the Eagles defense. Delhomme was part of an impressive opening drive, but that was about all she wrote for the Panthers offense. From there, Philly forced five Delhomme turnovers, and scored three touchdowns – one each on offense, defense and special teams — in a span of 4:57 early in the second quarter and later put the Eagles lead to 31-10 at halftime. 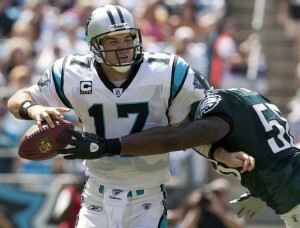 Overall, it was seven turnovers for Carolina, and the first benching of Delhomme since week two of the 2003 season. So where do the Panthers go from here? Do they think about going with backup QB Matt Moore or even Josh McCown? Is this team, a team that was two games away from the Super Bowl that desperate? “I hope so,” Delhomme said, when asked if he deserves to be the starter next week against Atlanta. “I’m not looking for the easy way out.” If things don’t get better in a hurry next week vs the Falcons on the road, the Panthers had better start thinking of a backup plan, even if that means a backup QB.